Serg Arabsky, Rapid Design Group CEO and founder, grew up in the business with his dad running his own shop after they immigrated from Ukraine in 2003. After graduating with a mechanical engineering degree, he decided to start his own company in 2011 as a one-man shop consulting in the oil and gas industry. With Serg’s background, he could speak directly about the problems his clients were facing and concluded quickly that he could offer not only consulting but design and manufacturing as well. Today, Rapid Design Group occupies a 17,000 sq ft facility with 22 employees, specializing in downhole drilling and completions for the oil and gas industry. In less than 4 years of opening his doors, Serg knew his company needed a management software system. When researching programs, he was specifically looking for software with limits far beyond what his company would need. He wanted an easy to use and visually appealing interface but wanted the opportunity to customize the complexity of the program as his jobs became more involved. Being a smaller shop, Rapid Design Group is a perfect example of how E2 can integrate departments quickly, start creating efficiencies immediately and help a shop plan, making every job easier. Once E2 was loaded and running in Serg’s shop, he was convinced he made the right purchase. His team has implemented many E2 modules including the QuickBooks and Data Collection modules. 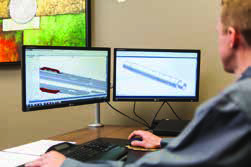 The QuickBooks integration was seamless and Serg says that Data Collection has moved his machinists to think more holistically about every project. It easily shows them where improvements can be made and works perfectly with prototype work to help control inventory. E2 wasn’t created for one shop type or for only the large companies. And Rapid Design Group proves that the software can be as simple or complex as you want it to be. Serg believes that any a size shop would benefit from the software. “If I was starting again, as a one-man shop, before my first CNC equipment landed on my shop floor, I would purchase and implement E2. It pays for itself in 3 days, easy.” Can you ask for a better ROI than that?